If BrowsingSecure managed to enter your system, it might flood your browsers with annoying ads that originate from unknown sources. Before anything goes wrong, we recommend removing the software from your PC. Accordingly, our specialist not only prepared a removal guide that is located below the article but also provided other important details about the application. For instance, the ads by BrowsingSecure might guide you to web pages that could be dangerous to your system. Although not all of them could contain malware, there are other threats you should be aware of. Applications like these usually gather some user data, and it is crucial to know if the program could collect your sensitive information. If you keep reading the article, we will tell you more about the software and how you could avoid it in the future. BrowsingSecure was categorized as adware application because it displays advertisements. There is legitimate advertising-supported software that provides free features and displays ads as a way to pay for the costs. However, BrowsingSecure does not offer any tools at all and yet it serves ads that should generate revenue from your clicks. To put it simply, the application is worthless for the user, unless you want to receive third-party ads, but we doubt it since they are potentially harmful. This doubtful application has no official website, but still it finds other ways to spread itself. 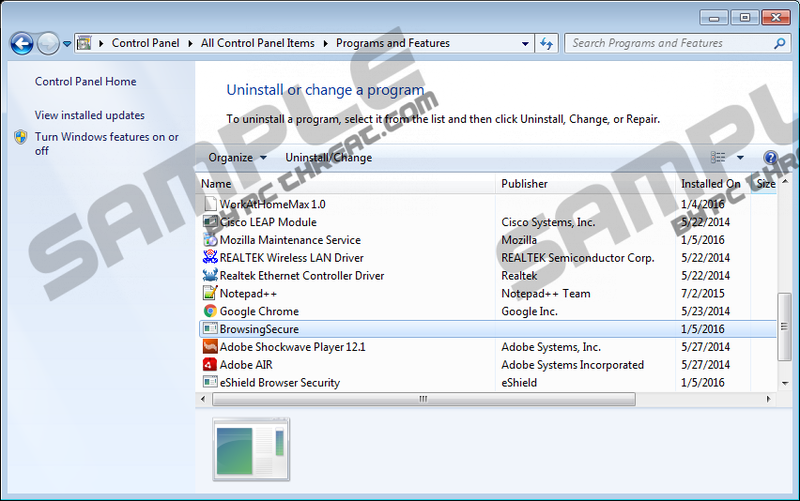 The program is very similar to other adware, e.g. FlashBeat, NavRight, and others. Likewise, it should also spread via bundled installers, which come from untrustworthy web pages. You might have downloaded it yourself if you like searching for freeware on unofficial sites. Bundled applications become visible when you launch the installer as they should be displayed as suggestions on the setup wizard. Of course, you can choose not to install them, but not everyone understands that they have such option. It does not matter now if you installed it knowingly or not, but for the future, you should choose sources of your download with care. Better yet, try to google the application, before you click the download button, and read some reviews. Lastly, you should know about the third-party ads that BrowsingSecure shows on the Google Chrome, Mozilla Firefox, and Internet Explorer browsers. These advertisements could be clickable so you might be redirected to their origin sites. Unfortunately, some websites may be created by someone who has malicious intentions, e.g. created it to spread viruses, Trojans or other kinds of malware. Other sites could try to extort money from you while gathering your sensitive data for fraud attempts. The fact is that there are many possible outcomes when you interact with third-party content that comes from unknowns sources. Also, the adware may have created a desktop shortcut that could be named something like GoodGames Empire.lnk. When we clicked the icon, it redirected us to empire.goodgamestudios.com, which seems to be a safe gaming website. Still the shortcut was created by this suspicious adware, so it might be better to delete it just in case. You can get rid of it if you right-click the icon and select Delete. Naturally, if you want to visit the web page, you can simply type its address yourself or google it to get the right link. Locate keys named as BrowsingSecure in each directory, right-click these keys and select Delete. Close the Registry Editor and open the Explorer. Go to %ALLUSERSPROFILE%, find the BrowsingSecure folder and right-click to delete it. Find a task with a random name (e.g. YTGYXESK1) and open it with Notepad. Locate a task with a random name (e.g. YTGYXESK1.job) and open it as a Notepad document. Right-click GoodGames Empire desktop shortcut and select delete. Quick & tested solution for BrowsingSecure removal.